NATIONAL WEATHER SERVICE IN MEDFORD HAS ISSUED A RED FLAG WARNING FOR SCATTERED THUNDERSTORMS WITH DRY FUELS FOR FIRE ZONE 284 WHICH IS IN EFFECT FROM 6 AM TO 11 PM PDT MONDAY. SISKIYOU COUNTY FROM THE CASCADE MOUNTAINS EAST AND SOUTH TO MTSHASTA. TIMING: ISOLATED THUNDERSTORMS COULD BEGIN AS EARLY AS MONDAY MORNING. THUNDERSTORM COVERAGE IS EXPECTED TO INCREASE TO SCATTERED MONDAY AFTERNOON THROUGH MONDAY EVENING. RAINFALL POTENTIAL: THUNDERSTORMS WILL PRODUCE LITTLE OR NO RAINFALL INITIALLY. HOWEVER AROUND A TENTH OF AN INCH OF RAIN IS POSSIBLE UNDERNEATH THE CORES OF THUNDERSTORMS BY MONDAY EVENING. IMPACTS: IN ADDITION TO LIGHTNING POSSIBLY STARTING FIRES IN DRIER LOCATIONS GUSTY AND ERRATIC WINDS ARE LIKELY NEAR THE STORMS. THIS WILL INCREASE THE POTENTIAL FOR FIRE SPREAD IF FIRE STARTS OCCUR. 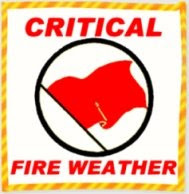 A RED FLAG WARNING MEANS THAT CRITICAL FIRE WEATHER CONDITIONS ARE EITHER OCCURRING NOW OR WILL SHORTLY. THESE CONDITIONS WILL CREATE THE POTENTIAL FOR EXPLOSIVE FIRE GROWTH.